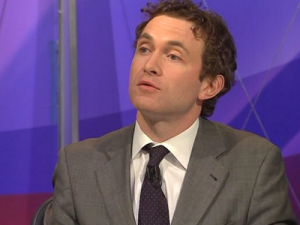 Douglas Murray (full name Douglas Kear Murray) (born 16 July 1979) was educated at Magdalen College, Oxford. Murray began researching his biography of Oscar Wilde's lover, Lord Alfred Douglas, while still at Eton. Aged only 16, he persuaded the Home Office to grant him access to Douglas's papers which were embargoed until 2043.The book was reportedly completed before Murray progressed to reading English at Magdalen College, Oxford, and was published while he was still a 21-year-old undergraduate there. His first book, Bosie: A Biography of Lord Alfred Douglas, was published in 2000 by Hodder and Stoughton (UK) and Miramax Books (USA). Acclaimed on both sides of the Atlantic, the book became a bestseller, and was reissued in paperback in 2001 and 2002. While still at Oxford, Murray began reviewing for the Spectator. He has since written for many other publications, including the Observer and the New York Sun. I haven't been in New York since the fall of 2000, when I was visiting this city to promote my first book. On the last day I was here, I visited a friend at her office on the top-most floors of the World Trade Center and looked out in awe over this great city. The assault on those towers proved the first in a now long line of attacks leveled against the free world. . The youngest published biographer in history, he wrote the bestseller Bosie: A Biography of Lord Alfred Douglas during his gap year. Having read English at Oxford, he is working as a freelance political journalist and researching a book about Bloody Sunday. His play, Nightfall, heads to London’s West End next year. It centres on a real-life dinner party in 1944, when Swedish diplomat and humanitarian Raoul Wallenberg tried to persuade his guest, Nazi Adolf Eichmann, from implementing the Final solution. In February 2003, he delivered a diatribe against the many first-time demonstrators who had joined the anti-war marches. Well, they get a free vote to decide who runs their country, unlike the people of Iraq, but they surely can’t expect the nation’s foreign policy to be run by occasional polls from the nation’s tabloids. They are mainly ignorant (by choice or chance) of the machinations of international weapons inspections, oil and the rest of it, but if they want to pretend to be experts, fine. Essentially they’re worried about war – so are we all. They hate the idea of Iraqi children dying – so do we all. But they do not have the monopoly on concern or morality. The problem is that they assume that anybody who was not on their march is pro-war. It is not the case. The rest of us may well be against the anti-war movement, or simply under the belief that these things are best left to the experts. Throughout 2003 Murray attended the Saville Inquiry into the Bloody Sunday shootings, to observe the evidence of the military witnesses. His interest in Northern Ireland, and the Bloody Sunday Inquiry in particular, is the basis for a new book due to be published after Lord Saville issues his final report. In 2004, he compared Saville to the Hutton Inquiry, which he also attended. For two weeks in 2003, the Saville Inquiry into the Bloody Sunday shootings in Northern Ireland in 1972 questioned men who were serving in the intelligence services at the time. For national security reasons as well as for their own safety, all were anonymous, all spoke from behind screens, and one could not turn up because of new Article 2 considerations. What documents could be produced were very heavily redacted for Article 2 and national security reasons. What questioning was possible was limited to questioning that did not impinge on Article 2 and national security issues. That was with people who had been in the field thirty-two years ago. An inquiry in 2004, inquiring into intelligence from 2002 and 2003, would not move forward very far. it is not the smugness of those who get their fix of “issues” that is the problem. The odious thing about this exercise is that it plugs a gap in the market for those who are cash-rich and time-poor. “Tribunal theatre” is simply filling a gap in the market for no-strings-attached, neatly packaged, moral tourism. Murray joined the Social Affairs Unit as a regular contributor in 2004.. In 2005, the Unit published his book, Neoconservatism: Why We Need It, which argued for the introduction of neoconservative ideas into British politics. The practice of equivalence in our national politics leads governments not to listen to, but to fear minority opinion, concerned lest anyone get the impression that the government knows what's right for the majority who have elected it. Not only does it make politics a glorified (though not glorious) pursuit of the personal – it makes the notion of fixed or natural right a nonsense. Because of course if everything is equal then everything is right: which means nothing is good or true..
Europe has used up its peace dividend. The holiday from reality it had for half a century during which it spent money on welfare whilst America protected its security, is now over – comprehensively so. Europe not only has unsustainable demographic issues which – if un-addressed - will eradicate the continent as we know it within three or four generations. It also has security issues, not least those associated with its unameliorated populations and its increasingly inefficient armies. It is late in the day, but Europe still has time to turn around the demographic time-bomb which will soon see a number of our largest cities fall to Muslim majorities. It has to. All immigration into Europe from Muslim countries must stop. In the case of a further genocide such as that in the Balkans, sanctuary would be given on a strictly temporary basis. This should also be enacted retrospectively… Conditions for Muslims in Europe must be made harder across the board: Europe must look like a less attractive proposition. By 2006, Murray was being described as a Senior Fellow of the Social Affairs Unit. Murray was appointed director the Centre for Social Cohesion when it was founded by Civitas in 2007. In July 2007, the Centre issued its first published work, an 'A-Z of Muslim Organisations in Britain', which claimed to be the fullest analysis yet published of the major Muslim organisations in Britain.. In August 2007 Murray and James Brandon co-authored the Centre's first pamphlet, 'Hate on the State, How British Libraries Encourage Islamic Extremism'. The Centre later claimed credit when the British prime minister announced that the 'Secretary of State for Culture, Media and Sport is working with the Museums, Libraries and Archives Council to agree a common approach to deal with the inflammatory and extremist material that some seek to distribute through public libraries, while also of course protecting freedom of speech'. In January 2008, the centre produced an analysis which showed that a third of Muslims signing a letter of support for London mayor Ken Livingstone were linked to the Muslim Council of Britain or the Muslim Association of Britain. Murray is a professed neoconservative and is the author of Neoconservatism: Why We Need It (Social Affairs Unit, UK: Encounter Books, US). He has described what he sees as, “a creed of Islamic fascism - a malignant fundamentalism, woken from the dark ages to assault us here and now”. Murray believes “we live…in a thought culture – but it is one in which the thought has gone bad”. He sees the main problem as being cultural relativism which he has described as, "the primary disease - the AIDS of the West – the disease which has made the opportunist infection of Islam so deadly". In 2007, after a Jewish community leader commented that British Jews should be aware of the existence of Islamophobia as well as anti-Semitism, Murray responding by calling it 'a myth'. He said: 'A phobia is something irrational, but there’s a very rational fear in being scared of Islam today and wanting to act against it. ... Islam is not a race, it’s an ideology. It’s not bad to dislike someone for their ideology. That is not racism.' Domestically he had advocated that, “all immigration into Europe from Muslim countries must stop” and that, “conditions for Muslims in Europe must be made harder across the board"
Murray voted for the Labour Party in the July 2007 Ealing-Southall by-election. In every country, and at all times, we like to rely on certainty. Certainty about the past, the present and even the future. Yet certainty is based not on inevitability, but rather on social and intellectual needs. We seek to uphold a common and stable experience, shunning the arbitrary in favour of closure in debate. We long ago reached the point where the only thing white Britons can do is to remain silent about the change in their country. Ignored for a generation, they are expected to get on, silently but happily, with abolishing themselves, accepting the knocks and respecting of their country. The English Defence League, when they started protesting had banners saying things like Sharia law discriminates against women, Sharia law is anti-gay. Well I'm good with both of those sentiments I'm sure most people in this room are. If you‘re going to have a grassroots response from non-Muslims to Islamism, that would be how you'd want it surely. But of course, we all know there are awkward things around this. There have been exposed links from the EDL with far-right organisations in individual cases, and maybe, others will know more about this, wider than that. But you know, Louis Amis wrote a very interesting piece in Standpoint magazine a few months ago and he said, and others have said that as far as they have seen within the EDL, they have tried to kick out BNP elements. Does that meant that they are racists or they aren't. I'm not making a definitive point, but I'm just saying these things are extremely complex, and we ought to be careful before dismissing whole swathes of people. Thirdly, these groups Stop the Islamization of Europe and Stop the Islamization of America, I don't know enough about them. As far as I can see Stop the Islamization of Europe only has a few members. In America, Robert Spencer is one of the directors, I happen to know Robert Spencer, I respect him, he's a very brilliant scholar and writer. We hope that people present took some of the points made by Mr Murray on board – they were sensible, practical points. Murray was a commentator on the suggestion by Archbishop Rowan Williams that there should be space for sharia law in Britain. "...when in Holland needs police protection and stays under an alias." "The organisers had assembled nearly all the writers most critical of Islam’s current manifestation in the West. The American scholars Daniel Pipes and Robert Spencer were present, as were the Egyptian-Jewish exile and scholar of dhimmitude, Bat Ye’or, and the great Muslim apostate Ibn Warraq." Despite the previous observation, Murray argued that: "There was no overriding political agenda to the occasion." "Murray lectures and debates across Europe in support of what he describes as neoconservative foreign policy [...] We pick Iran as a test case for his neoconservativism. First, basic realism is applied: When someone threatens to wipe out an ally, as Tehran's theocrats have repeatedly done toward Israel, you don't just say "that's interesting" or say that they "don't really mean it," he tells me. You take it as a real threat. Then you imagine how you'd ideally like Iran to be, which is as a non-threatening democratic government. Therefore what America and her allies should have been doing during the past few years is fostering democratic movements in Iran. "...since Israel launched its campaign to destroy Hamas in the Gaza Strip, Muslim "spokespeople" in Britain have once again made it perfectly clear to the UK government that if their opinions on foreign policy are not listened to, they can't promise the community won't make them heard in a rather more explosive way. And the government is listening. In 2005, the Muslim Council of Britain performed this trick. This year it has been played by the Quilliam Foundation, a new government-funded Muslim organisation which has already received £800,000 from the Home and Foreign Offices claims to be moderate but turns out to have the same old attitudes vis-à-vis our foreign policy as the last set of self-appointed Muslim leaders[...] QF's directors along with a number of other Muslim "spokespeople" wrote to the prime minister, threatening that unless Britain changed its foreign policy, distanced itself from the US and changed its relationship with Israel, then they couldn't promise that young Muslims experiencing a "loss of faith in the political process" might not simply detonate out of exasperation. Bosie: A Biography of Lord Alfred Douglas, Hodder and Stoughton, 2000. Neoconservatism: Why We Need It, Social Affairs Unit, 2005. Douglas Murray: I'm not a bigot but Paul Goodman is, ConservativeHome, 15 October 2011. It's Official: Muslim Population of Britain Doubles, Gatestone Institute, 21 December 2012. Census That Revealed a Troubling Future, Standpoint, March 2013. The Rise of the UKIP 'Hedgehogs', The Wall Street Journal Europe, 5 May 2013. Why all this country's enemies will be grateful for the schoolboy vanity of the Guardian, says DOUGLAS MURRAY, MailOnline, 9 October 2013. Tommy Robinson: Double standards, not fear of diversity, provoked the EDL, spectator.co.uk, 19 October 2013. Bob Pitt, Douglas Murray welcomes the EDL as 'a grassroots response from non-Muslims to Islamism', Islamophobia Watch, 30 January 2011. Paul Goodman, Why the Conservative frontbench broke off relations with Douglas Murray - and what happened afterwards, ConservativeHome, 17 October 2011. Cristina Odone, Douglas Murray must not destroy tolerant Britain with his Muslim-bashing, Free Faith, 17 October 2011. Owen Jones, Why is Douglas Murray smearing me to distract from this damning UN report on Israel in Gaza?, newstatesman.com, 12 March 2013. ↑ The Social Affairs Unit - Publications List: Neoconservatism: Why We Need It, accessed 20 March 2008. ↑ Amazon.com: Bosie: The Man, The Poet, The Lover of Oscar Wilde: Douglas Murray: Books, accessed 24 March 2008. ↑ 4 Douglas Murray, Scotland on Sunday 9 November 2003. ↑ An Unholy Alliance, by Douglas Murray, openDemocracy, 22 October 2002. ↑ Marching to hell, by Douglas Murray, openDemocracy 20 February 2003. ↑ Hutton - the wrong inquiry, by Douglas Murray, openDemocracy, 29 January 2004. ↑ Bloody Sunday, or the theatre of moral corruption, by Douglas Murray, openDemocracy, 11 May 2005. ↑ Profound insights of Leo Strauss, Douglas Murray, The Guardian, 30 December 2005. ↑ Leo Strauss' Philosophy of Deception, by Jim Lobe, Alternet, 19 May 2003. ↑ Douglas Murray, What are we to do about Islam? A speech to the Pim Fortuyn Memorial Conference on Europe and Islam, Social Affairs Unit, 3 March 2006. ↑ Open Letter to World Leaders on the Crisis in Darfur, 10 October 2006. ↑ Centre for Social Cohesion: Press Release, accessed 22 March 2008. ↑ Centre for Social Cohesion: Press Release, 1 July 2007, accessed 22 March 2008. ↑ PM uses Centre's 'Hate on the State' report to tackle stocking of pro-jihadist books by libraries, Blog, The Centre for Social Cohesion, 28 November 2007. ↑ Diary, by Douglas Murray, The Spectator, 25 July 2007. ↑ Naumann and Lord Inge are members of the International Advisory Board of World Security Network who also promote the document. See also: NATO: New "Grand Strategy" Proposed by Former Top Military Leaders, Dieter Farwick, 16 January 2008 (this report also appears on the 2007 International Analyst Network site, with both ramping up the terrorist threat). The Report was funded by the Dutch Noaber Foundation, Van den Breemen is an advisor to the Noaber Foundation as is Douglas Murray. Noaber's founder, J.G.P. Baan is also connected to the World Security Network as one of their Authors. ↑ Towards a Grand Strategy for an Uncertain World: Renewing Transatlantic Partnership, Noaber Foundation, 2007. ↑ Ian Traynor, Pre-emptive nuclear strike a key option, Nato told, The Guardian, 22 January 2008. ↑ Doug Sanders, Russia's problems nudge Afghanistan off the map, Globe and Mail, 2 April 2008. ↑ Douglas Murray in support of the EDL at One-Law-For-All Conference, Youtube, 28 January 2011. ↑ JohnJones, Allies Not Enemies – The EDL And The Sharia Literate Left United In The Counterjihad?, 28 August 2011. ↑ Mugged by Reality, The New York Sun, August 17, 2006, Daniel Freedman. ↑ Douglas Murray, We should fear Holland’s silence Islamists are stifling debate in what was Europe’s freest country, The Sunday Times, February 26, 2006. ↑ Power to the Spokespeople, Standpoint, February 2009, Douglas Murray. This page was last modified on 20 March 2018, at 07:59.